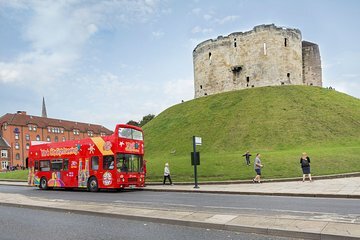 Resan tillbaka i tiden med en hop-on hop-off busstur i York, Englands quintessential medeltida stad. Din flexibla 24-timmars biljett gör att du kan bygga en anpassad resväg av Yorks främsta sevärdheter såsom York Minster, Jorviks vikingcenter, Cliffords torn, de imponerande York City-väggarna med mera. Med fri utsikt från den öppna kupén och 18 möjliga hållplatser runt om i staden, har du det bästa av staden till hands. Med den otroliga väsen i en äkta medeltida by, har York en blandning av bestående arv och modernitet, som erbjuder fascinerande museer, fantastisk gotisk arkitektur och en traditionell drick- och ätkultur. Med ditt 24-timmarspass (giltigt från första gången), se York högsta sevärdheter med ljudkommentarer som erbjuder ett fascinerande fönster in i det förflutna - laced med Roman och Viking erövring. Hoppa på den öppna, dubbeldäckande bussen vid någon av de 18 stationerna längs vägen och njut av flexibiliteten att välja din egen sightseeingresa och turens varaktighet. Ta ett bekvämt säte i antingen inomhus eller utomhus sittplats och ta in utsikten längs 1 timmars rutt. Koppla av när bussen gör hela slingan eller hoppa av vid något stopp - en annan buss kommer att vara med i 10-30 minuter för att hämta dig. Upptäck Exhibition Square och York Minster - en av världens vackraste gotiska katedraler. Gå sedan till Cliffords torn - de kvarvarande kvarlevorna av William The Conquerer's York Castle - följt av ett besök på Jorvik Vikingcenter för att få ett interaktivt utseende från 1800-talets liv i en vikingby. Sluta där, eller fortsätt till Monk Bar Fortress eller något annat stopp på den rutt som fångar din fantasi (fullständig färdväg nedan). Att avsluta din turné är lätt - bara hoppa av! Obs! Inträdesfess ingår inte i ditt hop-on, hop-off-pass. York was a beautiful city, would highly recommend the hop on hop off bus, it was a fast way to see the wonderful sights of the town. Wonderful experience. I didn't realize how small York was when I booked hop-on hop-off tickets. We were able to easily walk around the city and see all of the sites we were interested in on our own. We rode the bus for about 10 minutes total, mostly because we had paid for it not because we needed to take a bus. We did learn a few things about York's history, but I wouldn't book hop-on hop-off tickets in York again. This was a great way to get my bearings around York, its a beautiful city and looks big but its actually walkable. The bus was a good way of seeing the walls and there were lots of stops around the city. The bus trip is good value and a good way to get an overview. There are audiotapes in different languages for commentary. Our first trip was spoiled by a live guide who got on and stood at the front of the bus up top right in front of us blocking our view, plugged his microphone in and began live commentary. His accent made his English hard to follow, he big-noted himself and mocked our Australian nationality which we found offensive. We stayed on to see the sights but later in the day we repeated the circuit without a live guide. It was much better. Town is small and walkable waste of money to purchase bus ticket not a good value. Thoroughly enjoyed the tour. We hopped on and off 3 times, and all the drivers were pleasant and helpful. The recording was very informative, although it would be helpful if there were short pauses to allow for thinking! Great way to take a full tour of the City and then narrow down the places you want to explore in more depth. We were only in York for a day, and felt seeing the city on this hop-on, hop-off bus was the most efficient way to see the highlights. The live guide, and also the recorded tour, were very interesting. This was clearly very popular, and it was sometimes difficult to squeeze back on the bus if we had gotten off at big tourist site. A great way to see an overview of the City and then decide which bits you want to go back to. Drivers helpful and informative. Would definitely recommend this tour and try other cities as well.